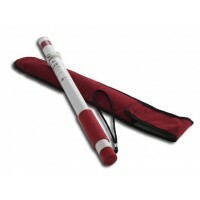 The AC HotStick is a high sensitive voltage detector designed for emergency responders manufactured by HotStick USA. Widely used across Australia, the AC HotStick has a purpose to simply aid in the detection of un-shielded live wires and other potential dangerous Alternating Current risks.The detection range will vary subject to the setting selected, Low/High/Front Focus. AC HotStick uses an audible beep and visual LED which will increase in rate or decrease whether the user gets closer or further from the voltage source.